A classic looking eyewear with rubberized nosepiece and temples for a secure fit. 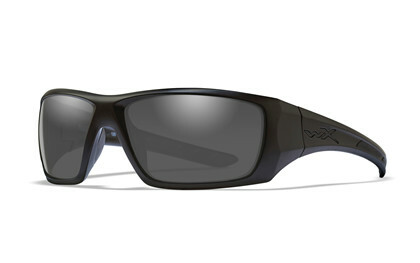 This Black Ops frame with the black WX logo gives you a powerful look but yet in a discreet way. Wearing this eyewear you will be ready whatever is coming your way. The Wiley X Filter 8™ Polarized Smoke Grey polycarbonate lenses offers maximum glare reduction, won’t distort colors and excellent in bright/glare conditions. The WX polarized lenses provides 100% UV protection and is coated with hydrophobic and anti-reflective coating protected by the T-Shell™ scratch resistant layers. Shatterproof Selenite™ Polycarbonate Lenses that Meet ANSI Z87.1-2010 High Velocity and High Mass. Impact Standards as well as US Federal OSHA 1910.133(b)(1)(1) Standards. 100 percent UVA/UVB. Protection with Distortion-Free Clarity. T-Shell™ Lens Coating Resists Scratching in Extreme Environments. Polarized Smoke Grey Lens Provides Max Glare Reduction with No Color Distortion.